In FY 2009, CHS added supported employment and day supports to our services. Services are home based and individually designed to meet each individual’s specific goals. Supervised by our Program Development Coordinator and staff of day service specialists, this program uses a psychosocial service model that includes recreational, civic, volunteer, career exploration, work training and job placement activities. The curriculum is designed to enhance self-esteem, promote positive behavior management, teach social and communication skills, encourage volunteerism and educate individuals relative to accessing and using community based recreation and leisure programs. Activities include group and individual counseling, job exploration and volunteer work in local, private non-profit organizations, development of career plans and participating in cultural, educational, recreational and leisure activities in the community. 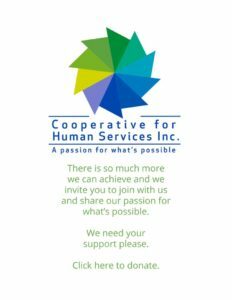 The Cooperative for Human Services emphasizes provision of creative activities that teach new and varied skills in communication, sensory-motor, activities of daily living, health and safety, exercise and nutrition. Activities include a broad range of typical adult activities for daily living, social relationships and job readiness. Cooperative For Human Services, Inc. (CHS) serves nearly 150 individuals over the age of fifty with developmental disabilities who are living independently in the community and in residential programs. Because of medical needs, a percentage of these individuals do not regularly participate in day programs or work. The company was an early pioneer in recognizing the challenges of aging and published the book, Of Two Minds, a practical guide to the complex issue of dementia and I/DD. The organization’s mission is also well-suited to support older adults: to enable, empower, support, and expand each person’s knowledge, skills, and natural capacities to direct and live full and meaningful lives within a community of their choosing. The mission is embedded within all service types; at all levels of the organization and serves as a basis for service quality. Integrated into all management decision-making and quality management processes, the mission guides the agency’s daily work. The organization continually builds upon the premise that all successful services begin with knowing and understanding the life story of each person: the experiences, the culture, the traditions and their hopes for the future. The CHS proprietary document, My Story, guides the development of services, social engagement and personal relationships ensuring that the principles of self-determination are central to the supports provided. Use of My Story ensures that services are highly individualized, flexible to meet changing health and mobility, cognitive abilities, sensory deficits, physical or personal needs and enhances the overall quality of life for older adults. With a deep working knowledge of aging-in-place and using a person-centered approach, the agency opened a drop-in center in Malden, MA and continues to deliver on a daily basis life-long learning opportunities, skill-building, and social activities for older individuals. At the end of 2016, the location was expanded in size and provides regularly-scheduled enrichment activities for groups, with the capacity to accommodate up to 60 people. It is handicapped accessible and features a full kitchen where healthy lifestyles are explored through cooking and baking, among other activities offered. In 2015, CHS created a smaller activity center at 220 North Road, Bedford where individuals from the surrounding communities congregate for socializing and group activities. The outdoor space is also used for picnics, dinner alfresco and lawn games. CHS further expanded its focus on healthy lifestyles and nature by opening a community farm and organic garden in North Reading, MA. Older individuals participate in customized activities such as planting, gardening, feeding farm animals and bird watching. For some individuals, these activities re-connect them to cherished memories of life on their families’ farms or time spent in their backyard garden. This is a particularly important aspect of socialization for individuals diagnosed with dementia. 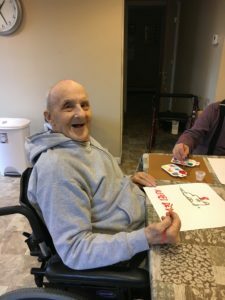 For those older adults served whose medical or mobility needs limit their outings into the community, CHS uses a mobile, “pop-up” approach to delivering engagement and social events. CHS coordinators customize activities based on input from individuals and deliver the equipment, food and supplies to the individual’s home. Activities are centered on socialization, building peer relationships and discovering new passions. Small animal therapy visits are also offered and for those struggling with dementia or on hospice services, it is a calming, connecting and uplifting activity in the security and comfort of their own home. Mobile programming is offered in 3-hour increments six days per week. For more information about this or other programs, please call 781-538-4626.